All around the world December is the most mystic month of the year. If you feel more spiritual or sentimental, maybe it’s the influence of the “Winter Solstice”. The behavior of our Sun and its influence on the Earth leads us down new paths. The solstice will encourage us to do some depth searching about our directions. The Winter Solstice has historical, cultural and religious significance. Many cultures organize feasts and festivals around this time. It was originally an important pagan feast. Christianity projected itself into the popular tradition of the birth of Jesus. We could delve into the mystery of this festivity at the hand of Kara Foxdale, priestess at Sacred Cauldron. 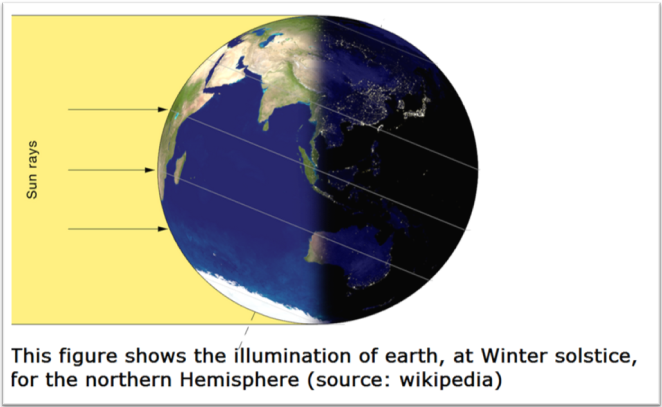 Bimala: What is a “Winter solstice”? Kara: “The Winter Solstice occurs astrologically, when the Sun reaches the coordinate of zero degrees Capricorn. The planet most resonant with Capricorn is Saturn. Both Capricorn and Saturn symbolize the laws, boundaries, rules and operating manual of the culture. The Solstice it starts on December 20 or on 21st which the solstice falls on normally is called the festival of the year Yule, celebrated by burning the hearth fires of the Yule log”. “The word Solstice comes from the Latin word “Solstitum” being a combination of two words “sol” meaning Sun and “stitum” meaning stop. 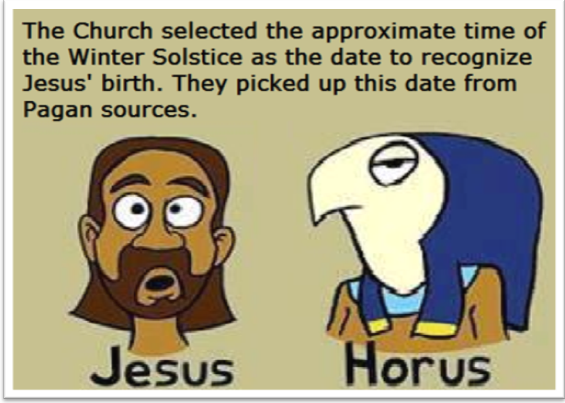 The Solstice has been celebrated around the world centuries before the Christian holiday Christmas. However came about from Christianity which had taken over the holiday and moved it to December 25 to Jesus birthday”. Bimala: Special attention should be paid to the cultural and religious significance of this time. Could you tell us about the relevance of the Solstice and Equinox in Spirituality? Kara: “Many mythology stories of a God being born on December 21st is Horus the Egyptian God who was born from his mother Isis and father Osiris. His birth was like Jesus as Osiris was not alive when Isis became with child. Other Mythology is about Odin who would represent the Holy King and also being known as Santa Claus. In other religions such as: Pagans, Wiccans, Norse, Celtic, and others celebrate Yule, from December 21st and on wards in recognition of the return of the Sun. Significance of bringing home a Yule log is to be burn with their families”. Bimala: You were very precise and it was very interesting. The animism perceived the presence of the supernatural as integral to, and linked with, the physical world. Every mountain, river, spring, marsh, tree and rocky outcrop was inspirited. In this sense, the sun had been worshiped by many cultures for centuries. It represents the main spiritual force. 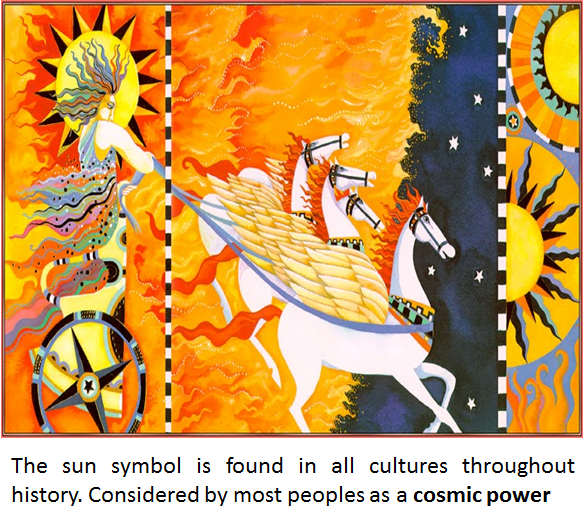 Kara: “We know that the Sun is a source of all light and life it is the center to all spirituality and the journey of the Sun through the sky or even the planets with it. It can be marked as, the four directions starting with spring, summer, autumn and Winter Solstice. The Solstices also equal to the four cardinal points East, South, West and North and the elements (Earth, Fire, Water and Air). Each of the Solstices are symbols across the Wheel Of The Year with the Sun at the center of the wheel. As the Earth moves in the sky the Sun changes positions in the sky, which influences over the light and darkness, day and night and death of the passing of the seasons, but they also hold a greater spiritual significance”. Bimala: So beautiful all you share. If we want to become more linked to our self, is The Winter Solstice” a great opportunity to develop and formulate our visions? Kara: “How would you formulate your own ideas? What actions are you working on to achieving what you say or how would you manifest these goals? Look at it as, the God is waking up from his slumber sleep and the Goddess now is going to rest now. So the solar aspect of the Sun shining down upon us we are the children of both God and Goddess, Lord and Lady. Your own focus should be your life, what you should you recognize and give sacrifice to the necessary? Acknowledgment or validation of the changes going on around you during each season. The change of the world around us and how the seasons move from one to the other we can see each one how it falls into place along the way and in celebration. Bimala Your words were a great inspiration and encouragement for me. For such inspiration rituals are superfluous. Let us know about some ceremonies. They are so significant for us to sanctify daily life and for groups of people to bond. 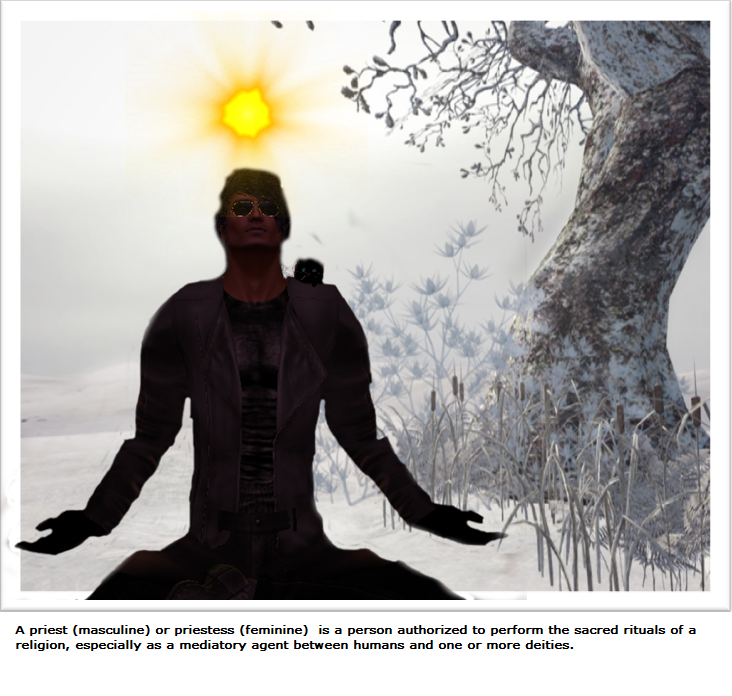 How can we participate in this rite in real life and second life? Kara: “In real you can find a group that is open to all who can come and attend a Real Life ceremony. You can look for real life groups off of Yahoo groups, www.wtichvox.com, Meetup, Facebook and other sources. You can also decorate your home with a pine tree, decorations, and a Yule log to burn using pine cones, ribbons, candles, incense, using a table or altar to put your decorations on, poinsettias, rein deer, Santa and other decorations. Food can be hearty such as stews, bread, cider, mead, mince meat pie, soups, and other winter foods. 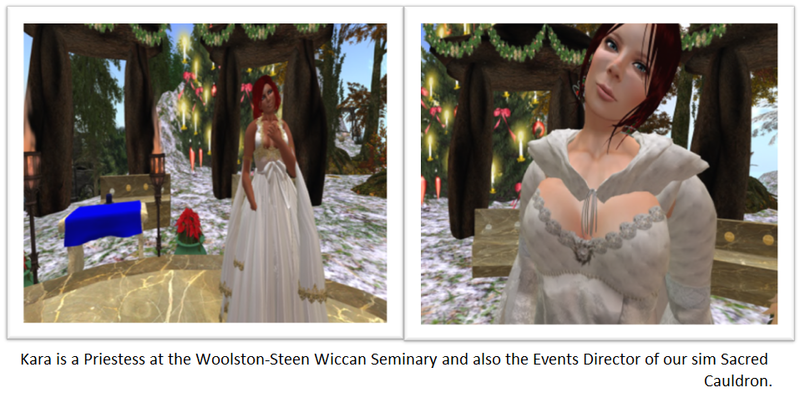 In second life world you can come to our Sim Sacred Cauldron and we are holding a Yule Ritual on December 19, 2014 at 7pm SLT. Our rituals are open to the public and we welcome everyone who comes to our sim we are known as a safe haven and a place of worship and if you are seeking the Wiccan or any spirituality path. We are a Moderate Sim welcome all types of avies from Dragons, fairies, fae, dogs, cats, wolves, and more”. Bimala: I will be there for sure. In fact, you are part of a Wicca study group in real life. 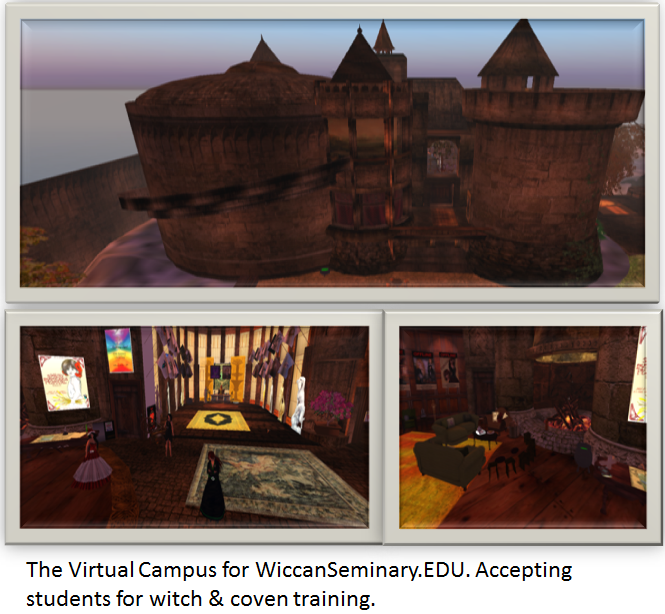 Kara: We are a real life organization and hold classes in world from our website (www.wiccanseminary.edu). We also are nonprofit and you can earn a degree in ministry from our school called “Woolsten-Steen Seminary located in Index, Washington”. Our classes in world cover on a wide variety of Wicca, Ritual, Crystals, Sacred Sexuality, Sacred Dance, Wheel of the Year, Shamanism, Celtic, Norse, Egyptian, Meditation, Greek Mythology, History of Wicca, Pagan Parenting , Kabbalah, Tarot and divination, healing and other classes. To take classes there is a fee of 39.00 dollars a month which goes to helping the school and our sim staying open as, we are a nonprofit organization as the teachers are volunteering their time some without payment. Our school and sim flourishes in helping those who are traveling a journey to wanting to learn and obtain knowledge. If you visit our website you will all the programs and classes that I have mentioned above. We have other programs in our school that helps with finance situations and there is an application for both processes.